Snow climbing season has begun and many south-facing routes are coming into condition! In honor of Sigmund Freud's 150th birthday, Amy and I sat down and planned a climb up a narrow, shapely strip of snow between steep, rocky walls. Even without any psychoanalytical subcontext, this was an attractive proposition for many reasons. 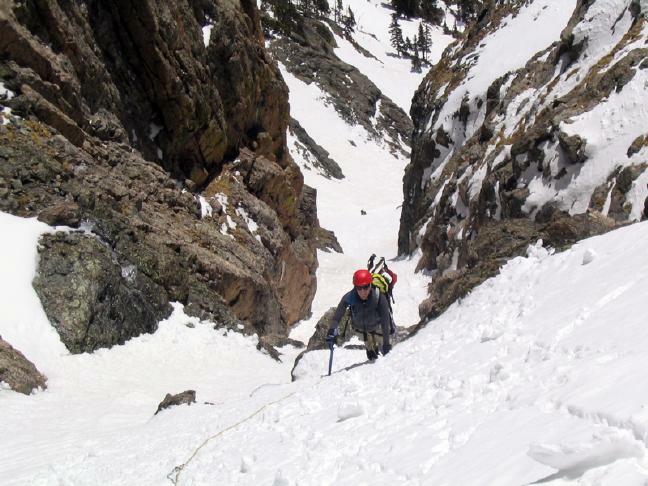 Amy has never done a serious snow climb before, but her technical expertise is not in question. She's been climbing rock for years now and is skilled at the mechanics of ropes and is fine with exposure and heights, she's just never done it on snow. Her limitting factor is endurance and speed and she tends to loose her drive on a long approach. 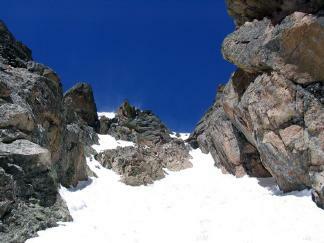 The south face of Flattop Mountain with the twin couloirs of Dragonstail and Dragonstooth fit the bill perfectly. Technically, they are both steep snow climbs about 1500' tall with an average slope of around 45 degrees and a few short cruxes of rock and/or ice to overcome. The setting, high above the spectacular Emerald Lake in Rocky Mountain National Park, is hard to beat, and the approach is a mellow two miles past a three lakes where we've been on a couple of other occasions. Furthermore, I knew several other people from SummitPost including my climbing buddies Andy and Fabio were planning on climbing Dragonstail the same day. While we wouldn't be able to match them in speed, we would take advantage of their nice boot track and would hopefully catch up with them for a celebratory beverage or two afterwards. We rolled into the Bear Lake trailhead at about 6:15 just as Andy, Fabio, Nelson, and Michael were heading out. We conferred briefly about avalanche conditions and the need for snowshoes before they hit the trail and we turned to kitting up. I was glad to have their extra expertise in these matters and felt better about such a committing climb knowing that they were in the lead and would turn back if conditions warranted it. We left the car at 6:30 and hiked the well-packed trail past Bear, Nymph, and Dream Lakes. The day was cool but mostly clear and the snow-dusted trees were gorgeous in the morning light. 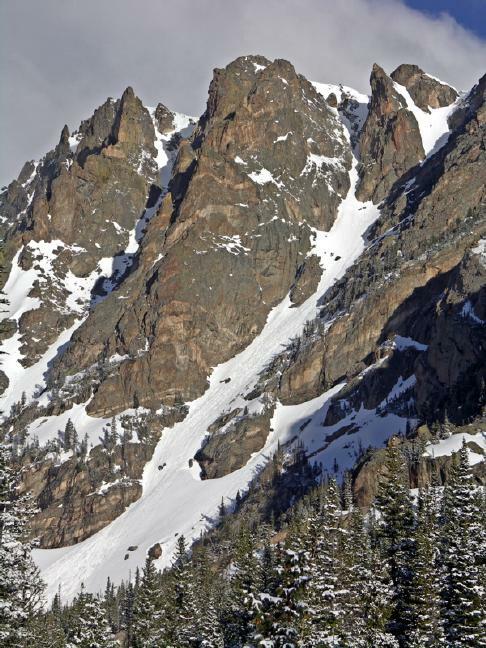 From Dream Lake, we got a good look at the couloirs looking impossibly steep and toothy. The top of Dragonstail splits in two around a prominent rock rib. The right fork, visible from our approach, looked wickedly vertical and was guarded by an obvious cornice. The left fork, what little we could see of it, looked like it had a rocky band to climb through. There wasn't an obvious cornice, but you can't always see from below. A fabulous shot, courtesy of Fabio, of Dragonstail in all its glory taken on the approach. From the bottom, it doesn't look nearly as intimidating. Fabio, Andy, Nelson, and Michael are visible starting up the route. 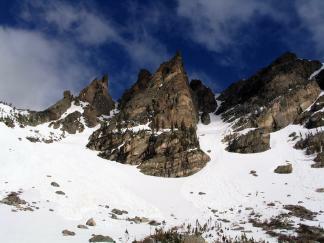 Dragonstooth, the sister couloir, is partly visible on the left. 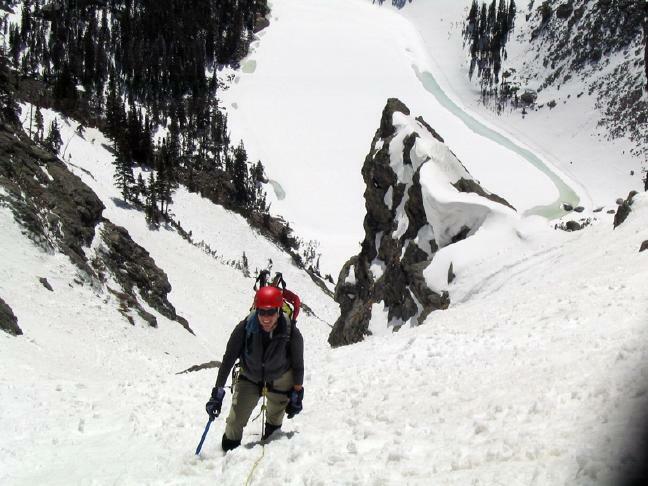 At Emerald Lake, we got a better look at the routes and saw that there were no technical difficulties in the bottom 2/3rds of the couloir. On the other side of the lake, the others were 'pointing up' at the base of the climb in the midst of a large pile of avalanche debris. It looked like several small slides had occured in the not-so-distant past. Still, the others, including the hyper-avalanche-concious Nelson, were going ahead with the climb. We skirted the lake on the south side and arrived at the staging area just as the others were a hundred meters up. From up close, I saw that the avalanche debris was at least a couple days old and had a thin layer of new snow on top of it. Looks good. All systems GO! 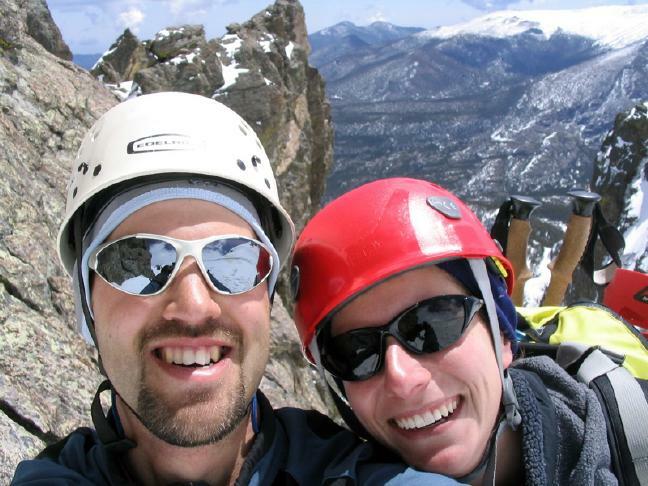 Swapping hiking poles for axes, and donning harnesses and helmets, we started up the route at 8:30. This was not quite as early a start as I would have preferred and the snow down low was crusty and soft. Amy had a hard time kicking steps. As we got higher, I took over step-kicking duty and we proceeded faster. Five hundred feet up, we enountered a large moat and the first logical resting spot. The slope had crept up steadily to about 40 degrees and the snow had solidified a bit. To ease our general comfort level and provide a real team climbing experience, we broke out the brand-spanking-new glacier rope purchased for the occasion. Amy tied into one end and I tied into the middle stowing the rest of the 30 meter rope in my pack. Amy reaches the moat and the start of the interesting part of the climb. From 2/3rds of the way up, Emerald Lake is starting to look very far away! The boot track here made a 20' leftward traverse before continuing up. Looking more closely, I saw that there was an actual cravasse to be avoided! It wasn't much, really only a crack about six inches wide and maybe three feet deep, but it was an actual crevasse! I was just as happy that we'd roped up already. I moved through it and encountered another, slightly larger one thirty feet farther on. A high step brought me safely over. Amy was not so lucky ending up sitting in the crevasse. A few creative moves and an axe belay got her out and onward. The climb proceeded smoothly for another half hour as the snow got progressively steeper. The rock walls became narrower and taller and we began to feel like we were really in the depths of the climb. 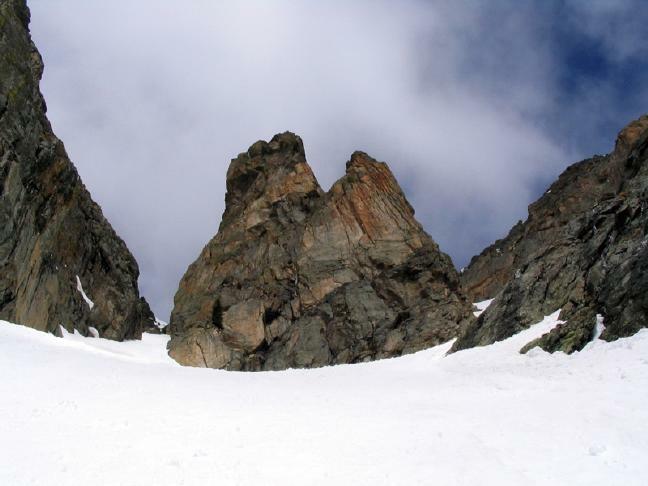 We deviated from the boot track, heading left to a large rock to put on our crampons. They hadn't been neccessary up to this point, but the snow was getting harder in places and the extra traction would surely help. 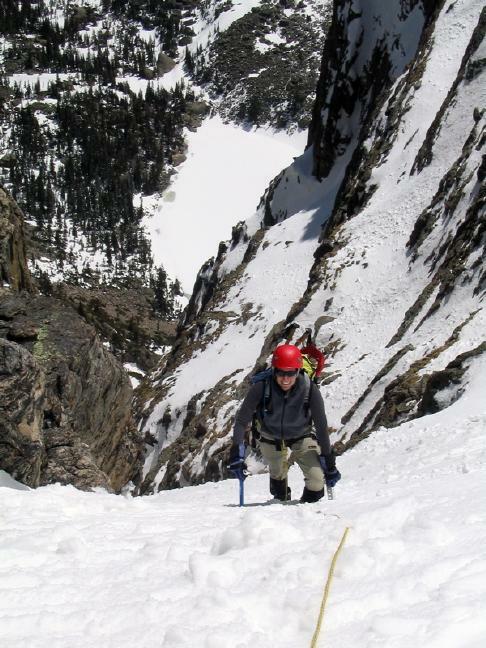 From here, we climbed a shallow chute around to the right of a small tower in the middle of the couloir and regained the boot track just below the split we'd seen below. Decision time! It was hard to see which way the others had gone; there were no obvious tracks in either fork! The left side looked narrow and steep and I knew there was a rock band to overcome. The right side looked clear the whole way up, but I knew there was a cornice there. It looked like the cornice could be overcome on the right, but this was an unknown quantity. Moving higher, I saw a narrow set of tracks threading the 30' wide gap on the left fork. Fine, we'd go that way. Left fork it is! From the narrows, we could finally see the top and the rock band. We stuck all the way to the right here and climbed the rock band at it's steepest but shortest part. This is the part I love! You're a thousand feet up in a realm that's not really vertical, but is definitely not horizontal either. Rock walls and towers on all sides like a weird canyon tipped at 45 degrees and covered in frosting. It's primal and comforting and scary all at once. I wondered what Freud would say. High above, a raven perched on the western cliff and called raucously. This is surely the cusp of living! Just past the narrows, the slope increased yet again. We could finally see the top as well. The good news was that there was no cornice nor was it very far away. The bad news was there were skiers up there preparing to descend the couloir (crazy buggers!) and they were knocking down occasional snowballs. The rocky band presented itself and we considered our options. A rope still dangled over the steepest part on the right and this looked like the most obvious, shortest way over the cliff. Amy and I bunched up in a marginally level spot about the size of a closet and prepared for the crux. Crampons scraping on gniess, I pulled a couple of moves on the overhanging rock discovering that it was a good deal spicier than I'd expected. Crampons on rock don't inspire confidence under the best of circumstances and I suddenly wished that Amy had me on a real belay down there rather than just being tied to the other end of the rope. Still, I was committed and muscled my way through a move or two that were probably low 5th class. Looking down, I realized that the others must have come up on the longer but less committing left side and that perhaps that would have been a good idea! Back on good snow above the rocks, the slope was the steepest we'd seen so far: at least 55 degrees, maybe up to 60! I'd used all 15 meters of rope and deployed the second half still in my pack. This allowed me to get all the way up to a boulder poking through the snow where I could manufacture a solid anchor. Amy surmounts the rock band. The narrowest section of the left fork is visible below along with a lone skier who was making his way up behind us. Everyone needs a "hero" shot. This is Amy's. The boulder was already occupied by a skier named Vicky (?) who very patiently waited for me to get situated. I put Amy on belay and she got over the step a bit more gracefully than I had. Still, a fall there would have been exciting and I was very glad to have deployed the rope! Once Amy joined me at the rock, the other skier, a guide named Matt, joined us for a steep pow-wow. Vicky rappelled down over the cliff (with skis on) and I started up the last of the snow to the summit. This was really steep stuff! I became nervous about the exposure and deployed a snow picket for intermediate protection. Reaching the full 30 meters of rope, I deployed the other picket and my axe as an anchor and belayed Amy up. The top of the climb was visible only 60 feet above and I set off with gusto. I soon found myself in a spacious and level (!!!) spot an easy ten feet below the top of the couloir and nicely out of the wind. Amy came up after struggling to get the snow pickets out (apparently they're more secure than I'd feared) and joined me, ecstatic at her success. She untied from the rope and made her way solo up the last few meters to the top. What a great climb! We were in high spirits. Flattop Mountain is not all that interesting in and of itself, but the views to north and south are spectacular and this is definitely the most interesting way to climb it. The weather was still okay, though a mass of clouds to the west spoke of potential future complications. 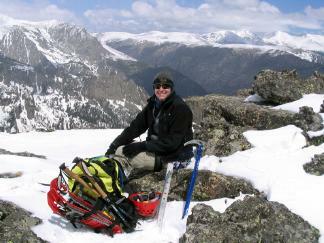 We packed gear hurriedly and set out down the easy eastern slopes. Along the way, we stopped by the top of the right fork we'd opted not to try... and a good thing too! 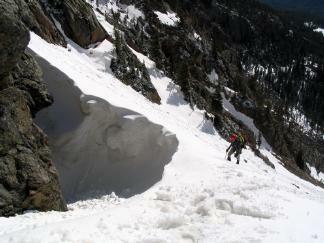 The cornice was huge and overhanging seemingly vertical snow! You could probably sneak around to the east, but even that looked unnervingly steep. We paused for lunch in there and soaked up the sun and views. Success! Look at that grin! The less said about the irritating and ambiguous descent, the better. The winter trail up Flattop consists of a couple dozen ski and snowshoe tracks through steep, dense forest and it was only by judicious GPS usage that we found our way out at all. We regained the car at 3:45 in a crowded and sunny trailhead feeling tired, smug, and quite ready for a long nap. What a great climb! It was fabulous to introduce Amy to the world of snow climbing and in a spectacular setting to boot. When you come right down to it, this was my hardest couloir climb to date as well. We got a chance to play with ropes and snow protection and I was impressed at how smoothly it went. The rope was so thin and light that it practically never got in the way. It kept us psychologically and physically linked and helped more than just safety. I am now all fired up for more of this kind of thing. It's going to be a good season!